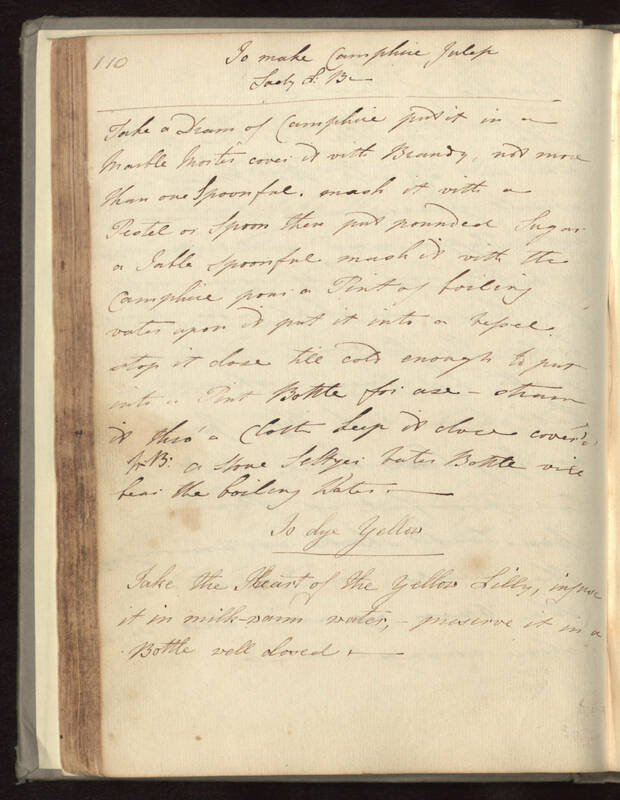 To make Camphice Julep Lady L: B Take a Dram of Camphice put it in a Marble Morter cover it with Brandy, not more than one Spoonful, mash it with a Pestel or Spoon then put pounded Sugar a Table spoonful mash it with the Camphice pour a Pint of boiling water upon it put it into a vessel stop it close till cold enough to put into a Pint Bottle for use - strain it thro' a Cloth keep it close cover'd NB. a stone Seltzer Water Bottle will beat the boiling Water. To dye Yellow Take the Heart of the yellow Lilly, infuse it in milk-warm water, - preserve it in a Bottle well closed.